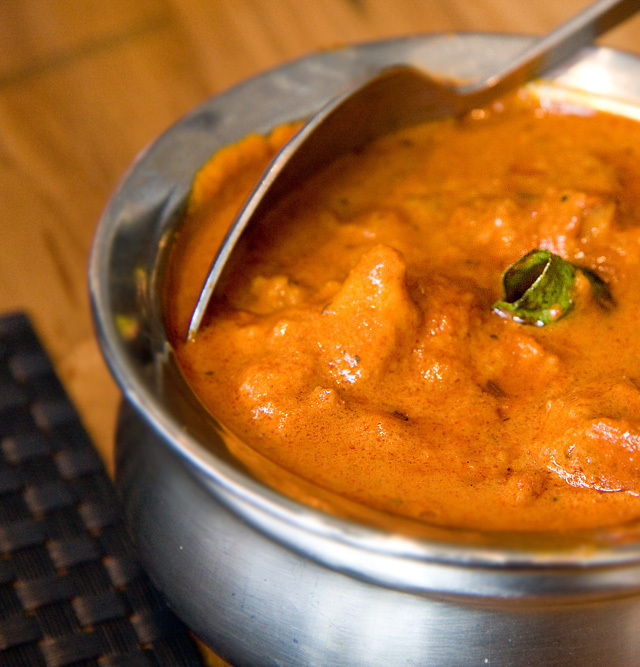 Kori Gassi also popularly known as Mangalorean chicken curry is a delicacy and signature dish of the Bunt Community. Kori means Chicken and Gassi means curry in Tulu language. Coconut plays an important role in this fiery chicken curry as its mild sweetness balances out the spicy flavors of the fragrant spices used in this preparation. Here is a recipe for Kori Gassi from Executive Chef Sudhir Pai (Holiday Inn Mumbai). Heat a large thick bottomed pan and add 2 tbsp of ghee and fry the sliced onion, poppy seeds, cloves and cinnamon till the onions turn golden brown. Toss in the grated coconut and fry for about 2 minutes till you get a nice fragrance, add the turmeric powder and toss for about 6-7 minutes till the coconut looks well toasted. Add the chillies, coriander seeds, cumin and peppercorns, fenugreek seeds, tamarind and garlic and roast for another 2-3 minutes. Turn off the flame and allow to cool. Grind to a fine paste using little water. In another large pan heat some about 1 tbsp ghee and fry 1 chopped onion till golden brown and toss in the chopped tomatoes and continue to fry on slow flame till they turn to a paste. Add the chicken and about 4-5 tbsp of ground masala and salt and mix well. Cover and cook till 90% done. Add the remaining masala and the coconut milk and a little water to adjust the consistency of the gravy and bring it to a boil.